Exploring the common ground between research and the arts; enabling artists in various creative fields and researchers to work and invent together: This is the mission of the SACRe doctoral program. The program is a result of the cooperation between six institutes: five major national grandes écoles for arts— Conservatoire National Supérieur d’Art Dramatique (CNSAD: national theatre academy), Conservatoire National Supérieur de Musique et de Danse de Paris (CNSMDP: national music and dance conservatory), Ecole Nationale Supérieure des Arts Décoratifs (ENSAD: national decorative arts academy), Ecole Nationale Supérieure des Métiers de l’Image et du Son (La Fémis: national film academy), Ecole Nationale Supérieure des Beaux-Arts (Beaux-Arts : national fine arts academy) — and the Ecole Normale Supérieure (ENS). These institutes are all members of PSL Research University. The objective of SACRe is to facilitate the emergence and development of projects that associate art and research and that are original in both their methods and their results. Encompassing multiple domains, as indicated by the name of the doctorate (SACRe: sciences, arts, design, and research), this truly interdisciplinary doctoral program brings together artists, designers, and performers, as well as researchers in the sciences, humanities, and social sciences, thus inculcating a close articulation of thought and sensitivity. The SACRe doctorate places the creation of works of art within the heart of a research environment, strictly associated with a critical approach based on potentially diverse academic fields. for theorists, in the production of a written thesis. 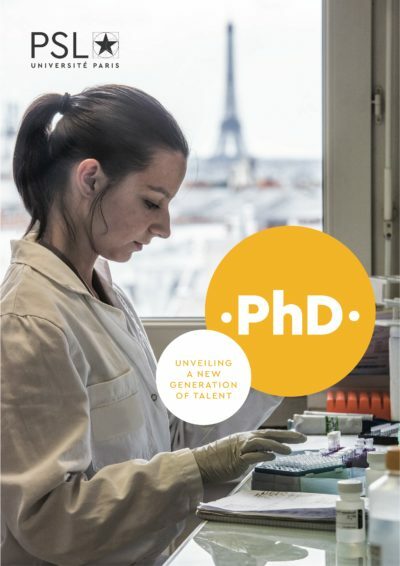 The thesis management (HDR) may preferably be chosen from among SACRe / Laboratory members (EA 7410), or one of the laboratories attached to the 540 doctoral school, and will include an artist also preferably from the EA 7410 or to one of the laboratories attached to the ED 540. The list of members is available on the ED 540 website or by clicking here (pdf format). Specific instruction is conducted in the SACRe arts schools or conservatories. Each institution arranges the type of reception, the organization, and the functioning of the program for the doctoral students. A general SACRe seminar aiming to explore the links between research and creation for all doctoral students admitted to the program. The program includes mandatory annual assessments and annual presentation of each student’s work. It also seeks to help students develop their portfolios and to prepare them to defend their theses. In addition, the seminar includes conferences, meetings, or visits linked to the range of disciplines covered by SACRe. Doctoral students are invited to participate in the development of publications, study days, and public events, as well as conducting activities in partnership with other establishments of PSL. Doctoral students admitted by PSL receive doctoral contracts that provide them with an allocation during three years, the legal duration of the program; postponement of thesis defense beyond the legal duration of three years is only possible under exceptional circumstances and, if approved, does not grant the right to prolong the doctoral contract. The amount specified in the doctoral contract is 1,684.93 euros gross per month (amount in force since 1 July 2010). Under certain conditions, doctoral students can benefit from specific aid to mount events related to their doctoral project: support for artistic production (works, exhibitions, concerts, etc.) and scientific activities (colloquies, publications, etc.). The SACRe doctorate is primarily for creative work by students from schools for the arts. It is the culmination of three years of research to obtain a Doctorate in Art. The thesis consists jointly of works of art in the different formats and media proper to each discipline and of a portfolio. The latter highlights the sources, experiences, research, and other practices, whether artistic or not, that have influenced the work. It provides a well-reasoned and critical reflection on the work accomplished during the three years of the thesis. Its form is defined based on the characteristics and approaches specific to each discipline and is matched to the candidate’s personal work, with the approval of the thesis directors. The thesis defense for doctoral candidates in the arts is based on the presentation of the works completed for the doctorate in diverse forms (exhibition, performance, concert, projection, event, or prototype) and the portfolio. The thesis defense for theorists is based on the presentation of the written thesis. Practical work carried out within the specific framework of this Ph.D. In both cases, on successful completion of the public defense, the national Ph.D. diploma is issued by PSL.